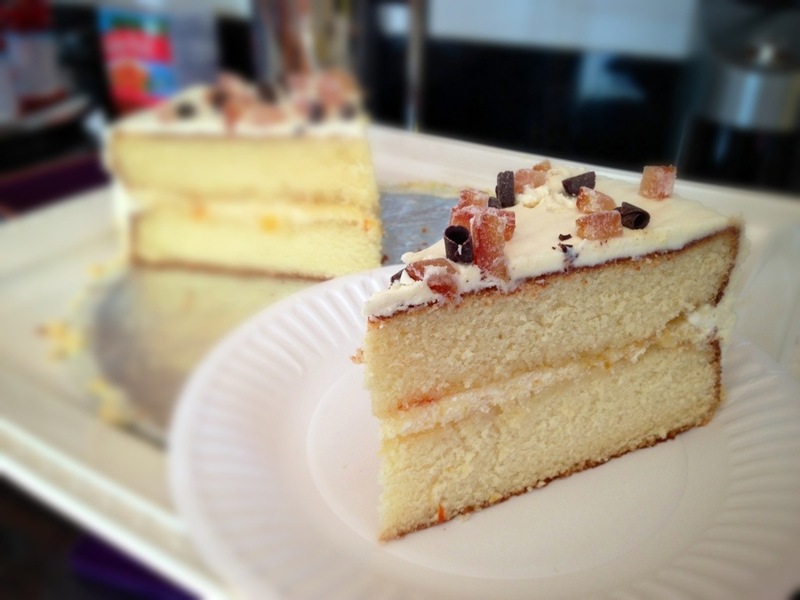 White Chocolate Cake With Orange Marmalade Filling [recipe] – Cin Cin, Let's Eat! I just finished watching Jiro Dreams of Sushi, and am feeling so inspired by this phenomenal chef as well as his incredible discipline and utmost dedication to his job. Have you seen this documentary? Over the weekend my husband and I hosted a joint birthday party for our dear friends. It was a potluck and we had quite a feast. I put together a simple mimosa bar station completed with juices and purees of blood orange, strawberry, and mango. I also took the responsibility of providing the cake. The weather has been so nice and Spring-like, I was inspired and wanted to make something colorful and fruity. I had the orange and chocolate combination in mind but didn’t want to make a heavy chocolate cake, then I found this wonderful recipe from Food & Wine and was very happy how it turned out! Yes of course I cut down the sugar from the cake but the buttercream was very sweet, it paired very nicely with black coffee though. I’m not a big fan of white chocolate, and I wonder if I can get unsweetened white chocolate? That would just be cacao butter right? Set 1 cake layer on a cake plate, right side up, and spread the filling on top. Cover with the second cake layer. 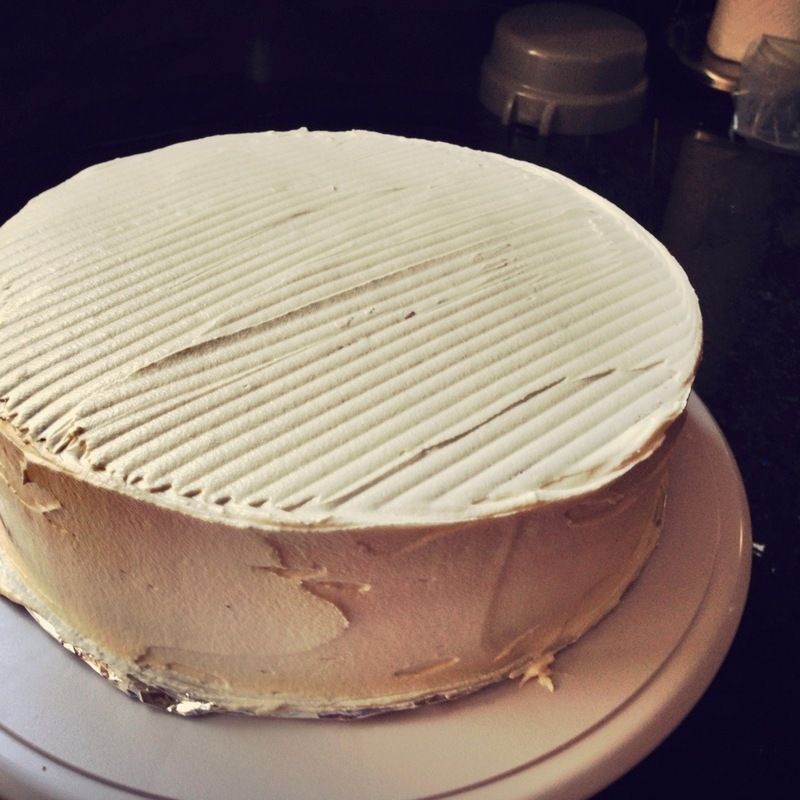 Frost the sides and top of the cake with the remaining white chocolate buttercream. 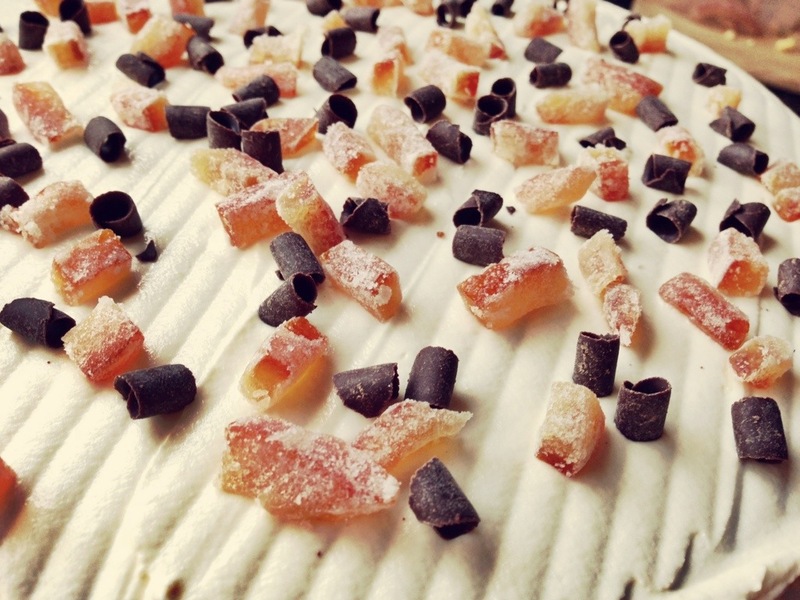 Garnish with the white chocolate–dipped candied orange peels and serve. 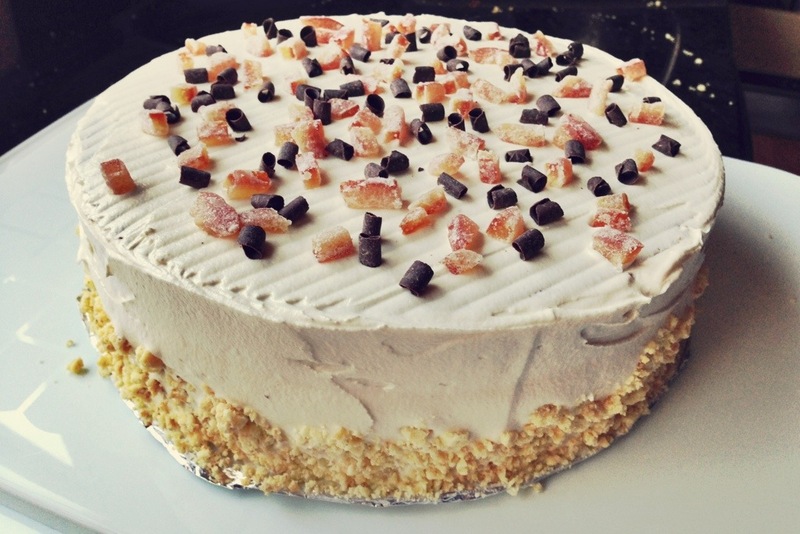 Notes: The frosted cake can be refrigerated for up to 2 days. The filling for this cake calls for orange marmalade, but you can also use seedless raspberry or apricot jam. 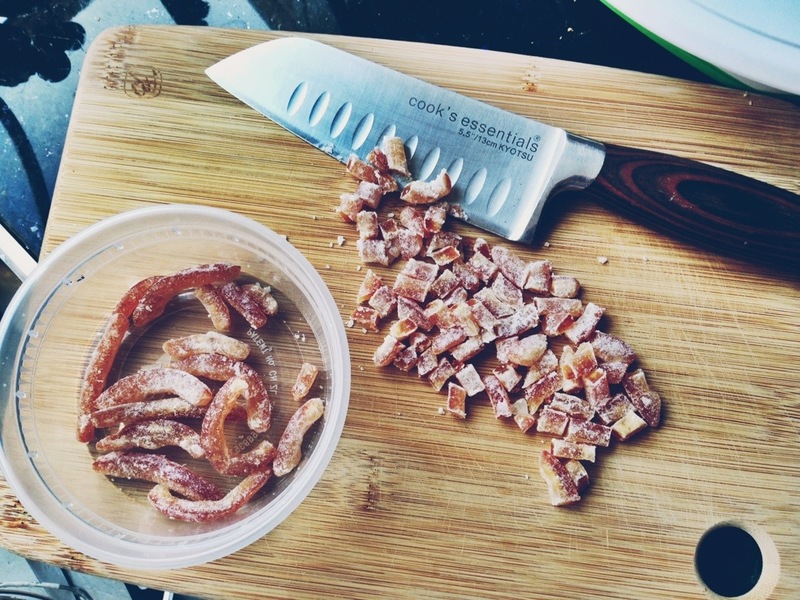 These would work well with the candied orange peel garnish. Edible flowers would also make a lovely decoration. In a large bowl, using a handheld electric mixer, beat the butter at medium speed until creamy. Beat in the melted white chocolate. Add the confectioners’ sugar and vanilla and beat at low speed, scraping the sides and bottom of the bowl, until light and fluffy. As you can see, I didn’t dip the candied orange peels in white chocolate. Simply diced them up and scatter them on top of the cake. I had some leftover dark chocolate curls so I thought that would pair nicely with the cake. The crumb-looking thing on the side is a mixture of white chocolate and orange zest. It was an experiment went wrong but turned out to be alright! The concept was to add orange zest into melted white chocolate, wait for it to cool and shave it into curls. But of course the chocolate seized up after adding the zest! (I’m infamous for doing this…it’s time to take a chocolate class and learn more!) Anyway, once it cooled down and solidified, it was impossible to shave as the texture is now crumbly (think feta cheese) and had a subtle crunch to it. I actually really liked it so I crumbled the whole block of chocolate and padded the crumbs onto the sides of the cake. I usually make cakes for others and don’t always get to taste it. Well, I taste the scraps and sometimes use the remaining ingredients and make a mini cake trifle for moi to enjoy. But this time I finally had the chance to taste a proper slice and was able to snap a picture of it! We loved that movie. I want to taste the rice. All that washing and care. I also want three big slices of this cake. What a beautiful cake – perfect slice by the way, impressive! 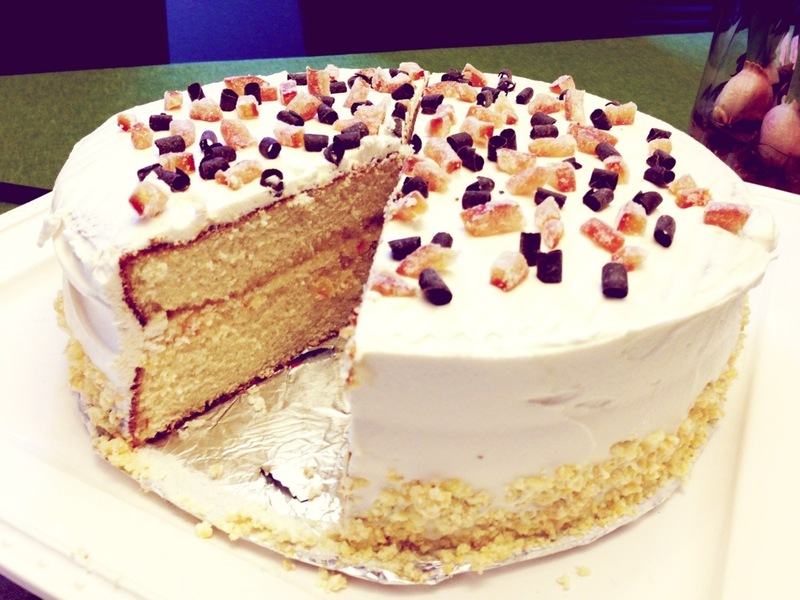 Pingback: Buttermilk Cake with Blackberries and White Chocolate Buttercream [recipe] | Cin Cin, Let's Eat! 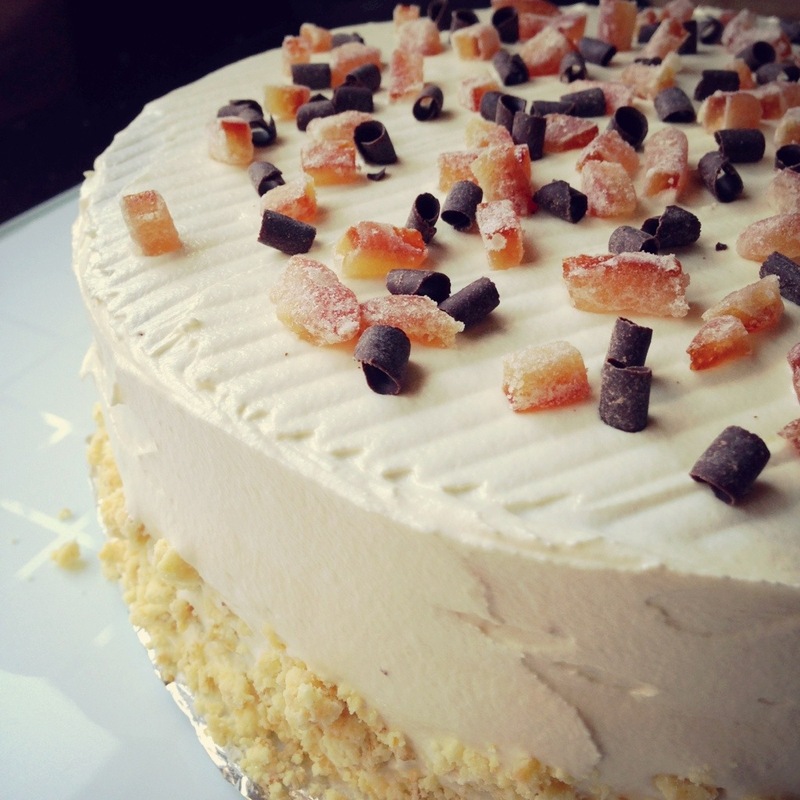 Pingback: Ballerina Cake and Cupcakes [recipe] | Cin Cin, Let's Eat! Pingback: Race Car Themed Birthday Cake [recipe] | Cin Cin, Let's Eat!